This photograph has been the subject of analysis by the documentary filmmaker Errol Morris. Fenton's most famous photograph is also one of the most well-known images of war. Across a desolate and featureless landscape, not a single figure can be found. The landscape is inhabited only by cannonballs-so plentiful that they first appear to be rocks-that stand in for the human casualties on the battlefield. The sense of emptiness and unease is heightened by the visual uncertainty created by the changing scale of the road and the sloping sides of the ravine. On a commissioned assignment, Fenton traveled in 1853 to the Crimean peninsula on the Black Sea, where England, France, and Turkey were fighting a war against Russia. To avoid offending Victorian sensibilities, Fenton refrained from photographing the dead and wounded. His more than three hundred images of encampments, battle sites, and portraits of all miltary ranks, became the first extensive photo-documentation of any war. 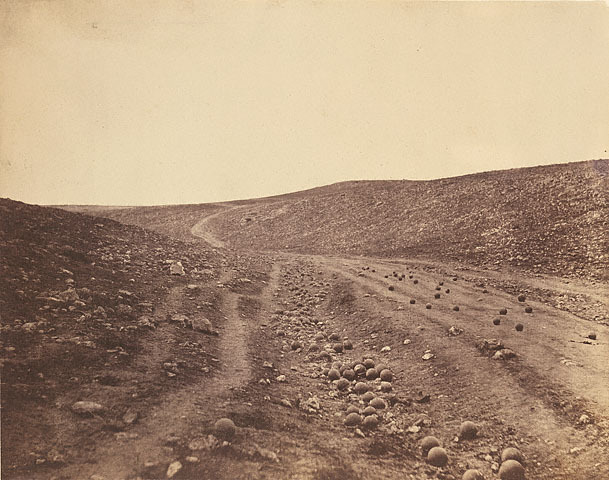 When exhibited in England, Fenton's photographs of the Crimean War established his reputation.